The celebrated former Observer television critic discusses the current Golden Age TV shows he sat down to binge watch upon being diagnosed with cancer. ...a joyfully intelligent appraisal of the major US series – the box sets – that have taken TV to previously unexplored heights over the past decade or two ... James takes a serious, or at least lengthy, look at some remarkable extended pieces of drama. It makes for brilliantly illuminating reading. It’s also very funny. For all his studied perceptiveness and weighty literary references, James possesses an irrepressible comic gift ... what makes these essays so worthwhile is the epigrammatic manner in which they add to the experience of watching or having watched first-rate television. ...a loving and breezy set of essays about the shows he admires and the flowering of TV more generally. This territory is so well-trod it’s worn-out, but if James’ essays are not all revelatory, they are—as one would expect—witty, insightful and unpredictable ... James is an old hand, and he writes with the perspective and habits of one, which occasionally makes him seem out of touch and condescending, when it is not making him seem wonderfully free ... Play All is full of riotous turns of phrase, keen observations, and sick burns ... One can occasionally feel James eyeing internet and millennial mores with a stink eye, pooh-poohing political correctness in ways that reveal himself to be an old. It irks me to have to wag a finger, but I’m going to do it, because there’s a lurking strain of reactionary crudeness in this otherwise deeply enjoyable little book against which it should have been inoculated at the editing stage ... Similarly, James’s armchair assessments of the relative desirability of various female actors should have been nixed, excised, prevented ... But don’t let these minor encrustations put you off. Play All is a small book but by no means a slight one. 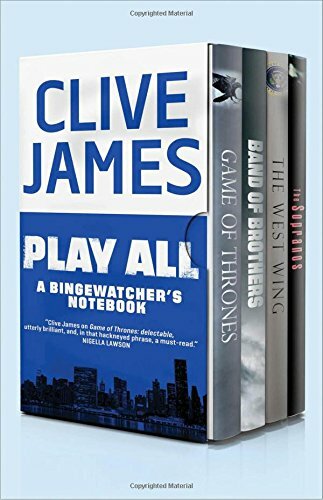 Large-brained and largehearted, and written with astonishing energy, it carries its study of the box-set dramas — these vast and spiraling narratives to which we have delivered ourselves en masse — into revelatory depths while reserving the right to be, wherever possible, superficial, waggish, ludicrous, Clive James-ian. What did you think of Play All: A Bingewatcher’s Notebook?